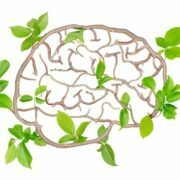 Brain Power – How to Preserve It! Want to learn how to preserve your brain power? Of course, you do; but you’d better start now-today! Like grapeseed oil, olive oil, coconut oil, avocado oil, and avocados; plus, pure pharmaceutical grade omega three fish oil. Your brain needs these fuel foods for energy and to repair itself. These are fats from plant sources-not animal fats. Animal fats should be eaten sparingly…more on that later. You can heat grape seed oil for sauteing; as well as coconut oil because it is not harmful to do so and healthier. However, heating the other mentioned oils in not healthy since heating changes the chemical state of these oils. Olive oil is particularly good drizzled on salads or steamed vegetables. Did you know that your brain and your gut are deeply connected? The health of your intestinal tract directly affects the health of your brain. How? You say. There has been a lot of talk about foods that have been genetically modified. These GMO foods, especially wheat and oats, both of which have gluten, may interrupt the process of absorption in the gut tract. If your gut is compromised at all so that nutrient absorption is impaired-your brain takes a hit. Sources of vitamin b 12 and folic acid are needed constantly to repair the brain and keep the memory and cognition functioning well. In time of stress the body depends and expends a lot of vitamin b 12. It needs to be replaced all of the time. One of the best ways to ensure that adequate amounts of b Vitamins are going into the body are to supplement with dairy free probiotics. Dairy free probiotics help to make the b vitamins the body needs. Many people may need more vitamin b 12 and folic acid to keep the brain up and running. Studies show that the best source of vitamin b 12 and folic acid is in the methylated form. It is highly absorbable and best administered under the tongue. It is recommended that 5000iu of b 12 be used. The methylated form of folic acid is available in liquid and pill form. With dementia and Alzheimer’s disease being on the rise-it is now known that people who have chronic stress and don’t relieve it or guard against it have a stronger chance of getting it. It is no longer thought of as an older person’s problem. People in their 30s, 40s, and 50s, are showing early signs of this debilitating problem. If a close member of your family like your mother or father became ill with memory issues paying attention would be a good idea for your own well-being. Preserving your brain is really the most important thing you can do!! Do you from time to time need to get away from the day to day and take time to decompress? Most of us do. That time away helps relieve the stress level and it gives the brain time to calm down. If a vacation is out of the question, then set aside time for quiet reflection. Basically, time to be quiet away from all media and noise. In a word…silence. Learning how to silence your mine-even for 5 minutes-can be done by focusing on breathing in…. breathing out…. To a slow count of 5. You can do this is in your car, your office, or your home; or anywhere-even if total external noise can’t be totally reduced. You can turn off your media. That’s a real vacation for your brain! http://dietnutritionsupport.com/wp-content/uploads/2017/09/Brain-Power-e1505932343924.jpg 256 350 cuselleration http://dietnutritionsupport.com/wp-content/uploads/2017/07/LOGOUPDATE-300x68.png cuselleration2017-09-20 18:31:532017-09-20 18:32:28Brain Power - How to Preserve It!